Leaked details of Tony Blair included his National Insurance number -- similar to a U.S. Social Security Number. 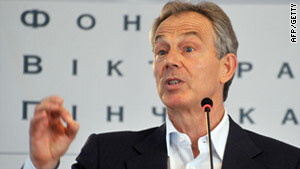 London (CNN) -- Personal details about Tony Blair that appear online were apparently not hacked from the former British prime minister's computer systems, but from the email account of a former staffer. Responding to a report about a hacker group that claims to have accessed Blair's personal data, a Blair spokesman said Saturday, "This information has not been obtained from Tony Blair or any of his office systems." "This appears to be information from the personal email account of a former member of staff from a few years ago," the spokesman said in an emailed statement to CNN. He didn't elaborate on the situation. The claim by a member of the hacker group TeaMp0isoN (Team Poison) was first reported by the United Kingdom's Telegraph newspaper Saturday. The group posted the information on a website called Pastebin.com that allows users to upload text. The information on Pastebin.com appears to include Blair's National Insurance number -- similar to a U.S. Social Security Number -- and the addresses and phone numbers of numerous personal contacts. The document has a note at the top that reads: "The information in this article was obtained in 2010 December, we still have access to the webmail server, phone numbers may have changed but all the information is 100% legit." It claims to include information on members of Blair's office, his address and phone book -- including the details of "family, friends, MPs and lords" -- and the contact details and resume of his former special adviser Katie Kay. CNN was not able to verify the authenticity of the information published on Pastebin.com. The PC Magazine website reported that the material had been leaked by a member of Team Poison known as TriCk. According to posts on TriCk's Twitter feed Friday night, the hacker group obtained the information in December. "Tony Blair's Private Info is getting leaked tonight, so is his Personal Adivsors CV and UK MPs & Lords who supported the war in iraq," one of the Twitter post said. An hour later, another post read: "doing the writeup now - Tony Blair and his cockroaches are getting owned tonight. - War IS Terror." This week, members of the Team Poison hacker group appeared to step into a row over recent actions by hacker group Lulz Security, tweeting that it would expose the identities of its members. LulzSec published Arizona police documents Thursday, obtained by hacking the Arizona Department of Public Safety. The agency confirmed it had been the victim of a cyber attack by LulzSec. The group has also claimed attacks on websites belonging to the CIA, the U.S. Senate and the United Kingdom's Serious Organised Crime Agency. It also obtained more than 1 million e-mail addresses, passwords and other personal information from the U.S.-based Sony Pictures.